The HoM awards went to Sally Malir, and Dave Wilby. Congratulations to them, they will receive technical running shirts from HoM sponsor UP & RUNNING. Justin Phillips reports ... in the opportunity of a life time Ash and I were lucky enough to experience one of the planet's greatest running spectacles. In only its fourth year this big city marathon already sits up there with London and New York as one of the finest in the world whilst in true Japanese style the organisation of the event was immaculate and the streets the entire length of the course were lined three rows deep with spectators. I�ve since learned that running is a national obsession in Japan which is illustrated by the statistic that over 300,000 people applied for the 33,000 places available. We chickened out of running the full 26 and a bit miles opting instead for the 10k event held over the same course. The pre race exhibition was simply massive with every manufacture under the sun peddling their goods and it represented an interesting opportunity to meet and swap stories with fellow runners from around the globe in pigeon English. The combination of jet lag, extensive sightseeing and the inability to find anything other than raw fish to eat beforehand kinda rules this event out of being a particularly fast course but what an amazing experience. For the record I think I finished about 9th in the 10k event in a time of 38.40 and Ash finished in 59.21 although now back at my desk with yet more jet lag I slightly regret not tackling the whole distance. If you�re thinking about embarking on an adventure for 2011 then you could do a whole lot worse than heading East. Gaenor Coy reports ... PB�s for Nigel Tapper, Paul Sugden and Jacqui Weston. First 10 miler for me. Great race and excellent results for windy conditions. Nice mug at finish. Note for future years - organisers made an announcement before race regarding swapped numbers asking people to make themselves known so that they could do accurate results. Nigel's report here ... This is the first time I have competed in the Snake Lane 10 and believe it or not my first flatish 10 miler. Previous outings over this distance have involved the serious hills of the Otley 10 and Guy Fawks so I knew a PB was almost a certainty. For those who may be contemplating this race next yea, I have to say it is well worth the trip. A nice low key unchipped event well organised and marshaled with organisers who have a sensible approach to number swapping. I have Pete Shields to thank for passing his number on to me only a few days before and a simple email to the organisers secured the swap without problem. Other racers I talked to on the day had managed to get last minute entries also. Not swaps but late entries just by emailing and asking the question. So maybe it's not too difficult to get into after all. The route is as good as flat by our standards and long straights on country lanes are interspersed by the "Snake Lane" meander which temporarily takes the mind of the torture of pb pacing! Other than a modest incline at around 8 miles the only other time inhibiting factor is the head wind which seems to dominate for a good proportion of the route. The start is a little confined for half mile or so but after that the route is as good as it gets. I'll be back next year. In the end I knocked about 4 mins off my pb getting in under the 70min barrier so I can't be anything but pleased. Malcolm Pickering reports ... the atmosphere was great, the mud deep in parts and hill 66 steeper than ever but all our Harriers saw it to the finish line of this inspiring event. Great running everyone !!!! In the Junior Womens (U20 race Jenny Dybeck produced another top class result to finish 37th in a field of 91, and there were great results from younger juniors too. Dave Wilby reports ... The first round of this year's English Fell Championships took place today at the Noon Stone event near Todmorden. (9m/2300') First mention has to go to the organisers for putting on a fantastic route, an event with great infrastructure, great organisation & a free race Buff. So good it could have been a Harriers event. Results from www.todharriers.co.uk. Team results later. Some good photos on www.todharriers.co.uk, and www.sportsunday.co.uk. This is a counter in the Harriers Race League. Paul Stephens adds .. This was hard, or at least I found it hard. Struggling on the ups, which are usually my stronger point, no pace on the rough stuff, and overtaken all the time on the descents. The photos on the Sport Sunday site aren't flattering, and the guy behind me at the end was worried he'd been beaten by another over 60. Made my day! I reckon I should have been about 5 minutes faster, but it still wouldn't have been a good time. Next year..... Thanks to Nick for the lift. Amanda Parnaby reports ... Emma Payne and I took part in the Myrtle Meander, 24.7 miles and 2,700 ft of climb starting and finishing in Bingley and visiting Egypt (in the snow ), Worlds End, Queensbury and Haworth. Lots of home made cakes available on route and stew with Yorkshire puddings at the finish. We spent most of the day talking and finished in 6 hrs 36 mins. Henry Heavisides reports .. Not the highest profile event today, but I ran 18:54 to finish 6th out of 200 runners at the 5k time trial in Hyde Park, Leeds this morning. It was very muddy in places, so not ideal for fast running, but it's always an enjoyable experience. As a reminder these time trials take place every Saturday morning at 9:00 & are free to enter. Full results and photos of the fell race are here. I said a quick thank-you in the forums, but it is worth repeating here. Over 30 volunteers turned out to help with the fell race today in tough conditions. Without you all the race would not have gone ahead. With a reduced field because of travel difficulties, the Club will have made very little financial profit from this event, but we have made a real contribution to the local fell-running scene and we have given something back to our fellow runners today. Thank you all. Andy's report here ... Back from Blackpool, after a worrying evening watching every weather website on the planet. The Runners' World forum thread on the event was split 50:50 as to whether it was "irresponsible" to even consider travelling with upwards of a centimetre of snow on the ground (and none on the roads, as it happened), and those who were in the "the race is on, I've paid, I'm having my money's worth" camp. I fell, predictably, into the latter - perhaps I've been living in Yorkshire for too long? Anyway - when I got there it was decidedly snowy on the ground, but not frozen, and the "lower walk" on the prom (tiddly om pom pom) looked clear. I was undecided as to whether it would be good enough underfoot to run fast, so I went and warmed up on the course to have a gander. I ran out to the 1 mile mark and it wasn't slippy - more slushy melting stuff, so I reckoned that a longish warm up and a "see how it goes" approach was what was required. At the gun I saw the proper runners whizz off into the distance, but even so went through miles 1 and 2 in 6:01. Mile 3 had a few funny twists and turns and came in 6:06, but by this time I was running pretty much on my own, as a large pack of runners were some 50yds ahead and I had nobody around me. I decided to "run my own race" as they say (roughly translated - "they all look a bit speedy - best stay back here"), but gradually people started dropping off the back of the pack and I overtook them one by one - after about 5 miles my place as "1st lady" was assured as I passed the leader of the women's race, then shortly afterwards we turned for the second lap. The wind didn't feel strong, but it certainly affected the pace as miles 5,6 and 7 were 6:09, 6:14 and 6:18 respectively. I had harboured vague fantasies of a sub-80 (encouraged by Paul "The Afterburner" O), but as the average pace for that is 6:06 that looked to be slipping away. Nevertheless I had people to chase now and miles 8, 9 and 10 were all sub-6:05, and at the final turn at 10 miles I had one Halifax Harrier in sight. The wind made its presence felt again and mile 11 was 6:14, but I felt pretty strong and I reckoned I might well catch the Halifax guy, who by now was only 15yds ahead. Then at about 11.5m my calf started to tighten - not quite what you'd call painful, but the early signs that something was amiss. I eased back a bit and (I think) adjusted my running style and managed to keep it feeling ok, but the pace, and the Halifax bloke, were slipping away. I did consider stopping, but I had less than amile to go by this time, so hung on with a 6:19 and a 6:21. As I came round the corner for the finish I could see the clock showing 1:19:56, and with me still 50 yards away the sub-80, though tantalisingly close, was gone. I finished in 1:20:09 on my watch, a PB by 1:15 but no official results as yet - I think I might have sneaked into the top 20, certainly reasonably near the front, although the leader looked to be miles out on his own. My calf was sore, but I don't think it's torn. A nice first aid lady gave me an ice pack straight away, and I blagged a massage from some college students who were practising on runners. It's now 4 hrs after the finish and my calf's a definitely tight but not sore to walk on, so fingers crossed I've not done too much damage. I saw Jann Smith looking very pleased with herself following a PB - not sure of the time, but she was looking relaxed and strong out on the course and at the finish - this marathon training's good for you! Diane Haggar reports ... only 3 ladies turned out today but there was much to cheer about as Jenny Dybeck took 2nd Junior Lady and gained selection for the Yorkshire team to run in the Inter-Counties event on 13th March. Lyn Eden's stirling effort towards the back of the field meant that the Ilkley ladies continued to fly the flag by completing a team. Malcom adds ... The ladies team team was in 11th place overall. Fell runner Ian Rowbotham led the Harriers men home to finish 71st and was followed by Malcolm Pickering 113th, Mark Iley 114th, Jim Towers 198th and Eric Morley 200th. Charles Oxtoby was the winner of a bottle of fine wine in Richard Gray's Handicap event tonight. He was followed in by Karen Lambe, new member Steve Newall, Diane Haggar, Kevin Wardale, Phil Chappell, James Pickersgill, and Mike Bryant, then a veritable flood of finishers. Thanks to Richard for working out the handicaps and organising the event. Nick Pearce reports ... three Harriers I think in this 11 mile 2750' classic promoted by Horwich RMI. Frozen ground made for some fast times, with the first three Rob and Danny Hope and Graham Pearce all well inside Simon Bailey's 2009 sub 1hr 30 minute record. Jez Hellewell reports ... a cracking little fell race in Heartbeat country. 101 runners, 8 miles & 1000 feet of steady climbing. Came 24th in 1.09. The winning time being 58 mins. Very boggy with no obvious paths at times, a thoroughly enjoyable morning out! Amanda Parnaby reports ... this event is organised by Scarborough and Ryedale Mountain Rescue Team, and originally stated as 23 miles from Ravenscar and via Harwood Dale to the North Yorks Moors and back over to Robins Hoods Bay and return to Ravenscar. However the Cleveland Way is eroding between Robins Hood Bay and Ravenscar and the route back was therefore diverted along the old railway line, this added an extra 2 miles but this was partly compensated by it being much flatter. The day began wet but brightened up in the afternoon. Finished in 6 hours 18 minutes. Henry Heavisides reports .. I ran the Parkrun 5k time trial at Hyde Park in Leeds this morning. It was my first visit this year to this race which takes place every Saturday morning. It's not a very fast course, mainly on tarmac paths in the park, but with a few very muddy sections, plenty of twists & turns and ups & downs. Today there were 201 runners taking part with times ranging from 16:58 to 43:47, so there was a wide range of abilities. My time was 18:34, which was my fastest time on this course & I finished in 9th place. Tracey Greenway reports .. Well it would have been a nice day if you could have seen it! Strident kit checks were going on, however that didn't deter 212 brave souls who set off on what was the 24th running of the Longmynd Valley's Race. Having run this race many times in the past, I knew exactly what a testing course it could be at 11.5 miles and 4500 ft of accent. Most of the climbing is in the last 3rd of the race within 4 miles of the finish! Ouch!! It's very easy to set off fast with the first 10k being run over fairly undulating ground and good paths you could easily be on for a PB. However the wise know to hold back and keep something for the "sting in the tail" and the final climb to Yearlet's summit. There are optimal route choices however i seem to do something different and un- optimal each year! With the ascents being a hands and knees job (well nearly) the descending is great fun and lots take the very un-glamorous option of bum skimming all the way down with some spectacular shows! When you can see the views I have to say that this race is one of the prettiest around - but not today. The finish was a close call with 8 seconds separating the winner Andrew Davies from Simon Bailey, Pete Vale was a further 5 seconds behind Simon, making it a one, two, three for Mercia Fell runners. In the ladies race Kate Bailey won in a time of 2.02.08 coming in 23rd overall. I finished happily as 3rd lady, 1st LV45 in a time of 2.07.30 40th overall. As always Mercia fell runners host and organise another great race providing all the competitors with a excellent post race food, hot showers/ changing and bar facilities. There is even a massage table for those with weary legs, this year I took that added option and it was heaven sent. I woke the next day with legs as fresh as a spring chicken! well almost!! Next year will be the 25th Running of the Longmynd Valleys Race, As it is a special year I am informed there will plenty of surprises, don't miss it, put it in your diary now. Henry Heavisides reports ... Conditions were near perfect for this morning's Dewsbury 10k and there were some fast times recorded, with the winner running under 30 minutes. Dave Wilby running his first ever road 10k led home the Ilkley Harriers, I think that he was surprised that there weren't any mountains, streams, mud or rocks on the route. Justin Phillips did another fine run only a fraction slower than his recent time at Ribble Valley. Jane Bryant won the prize for 2nd F40, with Alison Bennett 4th F45, Nick Pearce 3rd M55 & I managed to get 1st M55. Comparing pre race preparation was quite interesting, Vic doing a variety of swimming & cycling activities, Justin's preparation was at the Ilkley Beer Festival, and I managed to survive on a combination of Lemsips, Lockets & Sinex (not sure if these are illegal substances dope testing purposes). It should be interesting when the Power of Ten UK rankings are updated, as Jane, Alison, Nick & myself should all have qualifying times. In the Ilkley Harriers Race League, Henry is leading the road rankings whilst Nick Pearce retains his overall lead. Dougie Scarfe reports ... the rearranged race took place along the country roads around Catforth on Sunday. Although it was certainly chilly, the small field (235 runners, almost all from local clubs) enjoyed perfect running conditions and the course is virtually flat except for small undulations as you cross over the M55 four times! Delighted to do a PB, helped no doubt by our few weeks as members of the Harriers! In the Ilkley Harriers Race League, Mark Mon-Williams and Alison Eagle are now leading the XC/Trail category, with Nick Pearce still leading overall. From Jez ... Thoroughly enjoyed this race, despite the fog hiding all visible landmarks. Still, myself and fellow Harrier Toni Melechi, only slipped up the once, on Ilkley Moor of all places. Had we negotiated this better then we would have surely been sub 4 hour, as hoped. Geoff Howard reports ... it was a good job that the Start was next to the changing pavilion in fog-bound Graves Park, Sheffield, otherwise we might not have able to find it. 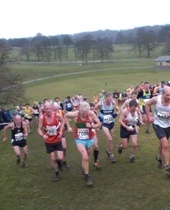 However the performances of the five Ilkley Harriers were far from gloomy. All our runners ran the same course even though the event was split into under 50 and 50+ races for logistical reasons. The fastest Harrier was Ian Rowbotham then Paul O'Looney. Our vet60 team (135 points) kept ahead of Leeds City (144) to take bronze medals and were close to second placed Bingley (130). Steve Turland reports on the Half Trog ... Richard Joel and I tackled the Half Trog yesterday. With practically zero visibility and featureless terrain it made for an interesting race with plenty of runners (including myself) going well astray. At times there were runners approaching checkpoints from all directions. I finished 10th in 1hr 38 with Richard close behind in 13th place. One thing's for sure, at over double the distance, they would have had twice as much fun. See Steve Turland and Bob Wightman amongst Eileen's pictures. Alistair Barlow reports on the Full Trog ... Nicky Jacquiery, Bob Wightman and I took on the Full Trog on Saturday. The route takes on the full spectrum of terrain from terrible tarmac to really terrible tussock. In between there�s tracks, decent trails, greasy paved paths, heather, mud and bogs. Capping it all was a thick layer of mist. After a disorientating start (how many fell races have a downhill start and then return to the start area 10 minutes later?) the internal compass was rendered useless by the trackless and fog bound crossing of Oxenhope Moor. No problem ... I reverted to my tried and tested navigation skills � follow the more experienced runner in front. Twenty minutes later I emerged on the Oxenhope � Hebden Bridge road without a checkpoint in sight. Not quite sure which way to turn the fell runner's instinct kicked in ... up hill! Half a mile later I was back on track.